Saturday dawned with an abundance of opportunities from which to choose. Lacking a clone of myself, I prioritized, designating the morning and late afternoon hours for photographing an ongoing harvest series. The midafternoon was set aside for an intriguing documentary showing at the Bijou Theater in Beach, N.D. Hardship to Freedom by photographer/videographer Ken Howie was playing at the Bijou. It celebrates the spirit of Ukrainian pioneers who immigrated to the prairies of western North Dakota in the early 1900s. 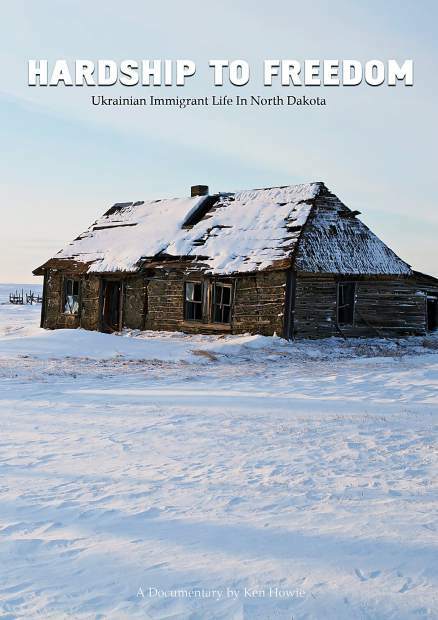 A native of Belfield, N.D., Howie produced the documentary in partnership with the North Dakota Ukrainian Cultural Institute located in Dickinson, N.D. Premiering in July, it was inspired by a book by Agnes Palanuk, Ukrainians in North Dakota: In Their Voices (2011, Ukrainian Cultural Institute, 152 pages, photos and illustrations, softcover). Palanuk, whose name is synonymous with the Ukrainian Cultural Institute, was in attendance at the showing. Passionate about preserving the traditions and cultural heritage of the Ukrainian people, she advocates nurturing, preserving and sharing one's heritage with children, grandchildren and generations yet to come. Such tenacity served her ancestors and their countrymen when they came to America. Some came for political freedom, others religious freedom and some for free land offered under the Homestead Act. Impoverished and suppressed by more than 200 years of Russian rule, the hardships they faced were the price they paid for freedom. Watch the trailer at http://vimeo.com/68162582. Howie weaves video interviews he conducted in with vintage photos and first-person accounts from interviews Palanuk conducted in the 1980s. Often sobering and sometimes amusing, the stories portray the determination of people who had no alternative but to prosper. While focusing on the Ukrainians, the film crosses ethnic boundaries. It is the essence of the homestead experience. See http://www.hardshiptofreedom.com/. http://vimeo.com/68162582The Hardship to Freedom DVD sells for $25 plus $5.60 shipping (check or money order) from the Ukrainian Cultural Institute, 1221 West Villard St., Dickinson, ND 58601; 701-483-1486; http://ucitoday.org. Discounts apply on multiple purchases. Palanuk's Ukrainians in North Dakota: In Their Voices is available from the North Dakota Historical Society for $24.95 plus shipping. Contact the museum store at 701-328-2822 or museumstore@nd.gov. James "Scotty" Philip, the man for whom Philip, S.D., was named is the subject of The Buffalo King, a documentary by director Justin Koehler. Like Howie, Koehler was drawn to a subject from his home state. Koehler grew up about 30 miles from Philip. Many of the on-location scenes and interviews were filmed between Philip and Fort Pierre during the Historic Bad River Trail Scotty Philip Memorial Ride held in 2011. Internationally screened and distributed to public television stations in all 50 states, Koehler's 58-minute film tells the story of the bold and adventurous Scotty Philip, who emigrated from Scotland in 1874. Drawn to the Black Hills following the discovery of gold, Philip worked as a teamster, a scout and a cowboy before establishing his own ranch in Stanley County, Dakota Territory. During that time, he witnessed the massacre of Indians and the slaughter of the bison. At its peak, Philip's herd numbered nearly 1,000. When he died, he owned the largest domesticated herd of buffalo in the country. Animals from his ranch populated herds across America. Philip was inducted to the Hall of Great Westerners at the Cowboy Hall of Fame in Oklahoma City, Okla. Watch the trailer at http://www.youtube.com/watch?v=YZYqxXuyLlY. The Buffalo King DVD sells for $19.95 plus shipping from Amazon.com. Koehler is currently working on a documentary about 9-time World Champion Saddle Bronc Rider Casey Tibbs. Updates are posted on Facebook at Floating Horses: The Life of Casey Tibbs.